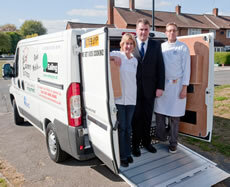 On Thursday 1 October 2009 the Leader of Ealing Council, Jason Stacey, launched the first ever Kids Cookery School Mobile Kitchen Unit. The van has been designed and fitted out with mobile kitchen units, ovens and hobs, even the kitchen sink! The units are wheeled into any setting or venue with two chefs on hand to deliver a practical cookery session in any community. Ealing Council has provided £50,000 to get the van and units on the road. As it is increasingly more difficult to move children and young people around the borough the answer is here! KCS comes to your community, school or holiday club and teaches anyone and everyone how to cook fresh delicious food from scratch on a budget. KCS mobile is one of the solutions to many of our health and social problems of today. If children learn how to prepare and cook fresh food they can lead healthier lifestyles and make better informed decisions on what to eat and drink. Councillor Jason Stacey said: "The council is pleased to support this innovative project. The Kids’ Cookery School has been at the forefront of teaching young people how to cook nutritious and varied food at prices that will fit into hard-pressed budgets. The council will continue to work with the charity to ensure as many young people around the borough can access their services." KCS is a registered charity aiming to build a healthier generation. Parents, government and health professionals are increasingly worried about the poor content of our children’s diet as they become the victims of the fast food nation. The only real solution to this problem is to teach all children, from the earliest age, about making good food from fresh ingredients, how to use it for their own benefit and take pleasure in it for a lifetime. Since KCS opened in 2000 the colourful purpose-built kitchens have been buzzing with activity and over 18,000 students have passed through its doors in Acton. Children take part in practical cookery classes, workshops and holiday clubs taught by chefs who inspire with their love and passion for cooking. As a charity KCS is dedicated to reaching as many young people as possible, children from every background and ability, however, KCS still struggles to find funds to pay for the ongoing costs of the school and mobile unit and needs to raise revenue to keep the important teaching on-going.